Innovative educators know the importance of integrating technology into teaching and learning. Where they sometimes fall short is sharing the "why" with others in the school community. This was one of the key takeaways from a group of innovative district leaders who came together from around the country to explore important issues at the Tech & Learning Leadership Summit in Phoenix Arizona. Without the "why" in place you run the danger of administrators and elected officials thinking technology is about increasing test scores. 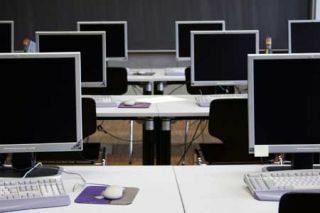 Staff being concerned technology will replace, rather than change, the role of teachers. Parents becoming fearful that screen-time will turn their children into zombies. And, students accepting the use of technology as a substitution for drill and kill worksheets rather than as a tool to empower their learning. While we intuitively know better, if you don't make the "Why" explicit you can't be surprised if intentions are unclear and success is measured incorrectly. There is a model in place in which to look at this called the Golden Circle created by Simon Sinek. The Golden Circle has the why in the center with how and what in rings around the center. The WHAT ring represents the schools products or services. The HOW is an explanation of what the school does. The WHY is about what a school believes in. Sinek uses the example of Apple. Why? They think differently, thereby challenging the status quo. How? By informing their potential buyers that their eye-catching designs are easy to use. When it comes to technology in your classroom, school, or district how are you answering these questions? How are you incorporating the input of stakeholders, getting everyone on the same page, and communicating these answers?